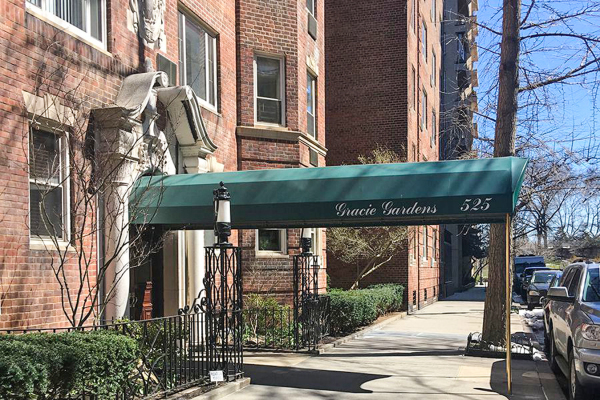 Four red-brick buildings sharing an expansive inner courtyard and lush common garden comprise Gracie Gardens, a gracious pre-war coop built in 1942 on 89th and 90th Streets, between York and East End Avenues. The Georgian-style mid-rise buildings have canopied entrances, attractive sidewalk landscaping, and bay windows. 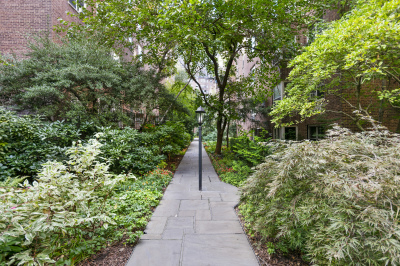 The development was designed to enjoy East River views and to provide suburban advantages within the city by allocating 50% of the site for gardens and courtyards. These outdoor spaces are beautifully landscaped, with cobblestone paths winding through abundant foliage, where trees and bushes of varying heights and shades mingle. Black lampposts hearken to an earlier era and benches provide seating. The complex’s generously-sized, impeccably-renovated apartments combine high-end modern convenience with the old-style luxury and elegance of these full-service buildings. You’ll appreciate the pre-war picture moldings, spacious bay windows, and gleaming hardwood floors that reflect the natural light flooding in from many large windows. Gracie Gardens is located just steps from Asphalt Green and the family-friendly Carl Schurz Park with dog runs, children’s playgrounds, basketball court, and the mayor’s official residence, Gracie Mansion. It’s also close to excellent dining and shopping. And getting around is quick and easy with the opening of the new Second Avenue subway, as well as the ferry to Wall Street.